For one hundred years, Children’s Aid Society (CAS) has been finding homes and building families for children and youth who have been neglected, abused or who are otherwise at-risk. CAS served 10, 492 individuals in 2012. Although available to all - 85% of families served by CAS live below the poverty line. 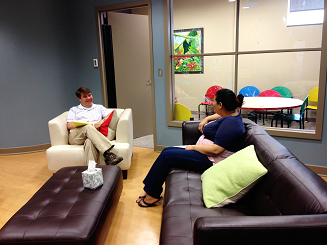 CAS provides counseling and other support services to individuals and families at no charge. •	More than 9,000 children were victims of abuse and neglect in Alabama in 2012. •	260 children and youth in Alabama are looking for an adoptive family. •	Almost 300 youth age out of the foster system every year in Alabama – left without a permanent family connection. •	33% will be receiving some kind of public assistance. •	33% will have experienced homelessness. •	50% will be unemployed. •	81% of the young men will have been arrested. •	77% of the young women will have been pregnant. CAS is one of the oldest and largest United Way agencies managing a $5 million annual budget. Our statewide programs are served by satellite offices in Montgomery, Mobile, Huntsville, Jasper, and Florence and programs in Dothan. CAS’s has a professional team of 76 staff consisting of 31 licensed social workers and 4 licensed counselors with master’s degrees, as well as, experienced administrators and skilled business managers ensuring efficient and effective programing that delivers results. The historic $2.7 million Home at Last Campaign will position Children’s Aid Society to address the needs of children, youth and families for the next century of service. The comprehensive fundraising campaign for CAS’s exciting new Center for Youth and Families also will help underwrite key programs for expansion of services. 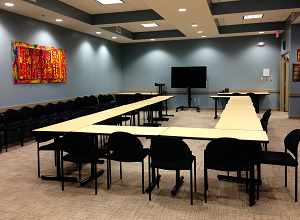 The Center for Youth and Families increased office and group meeting space will allow CAS to continue its scope of work, respond to emerging needs, expand existing programs, as well as offer new services. 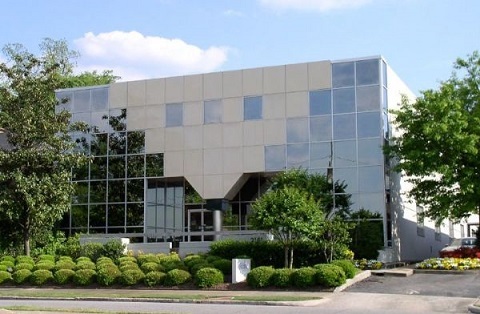 After an extensive search (additional search history) and with a lead gift of $750,000 from Children’s Aid Foundation, CAS purchased for renovation a 17,721 sq.ft., two-story building with basement at 2141 14th Avenue South in Birmingham’s Southside. Being closer to the City Center, the interstates, many of CAS’ nonprofit service partners, homeless shelters, and bus routes, as well as having a street-level entry, make this building more accessible for those we serve. Locating in a safer neighborhood within a few blocks of the Southside Police Precinct and with an adjacent parking deck encourages more nighttime meetings and after-hours programming. A building of our own that bears the name of Children’s Aid Society Center for Youth and Families will help us be more visible, more accessible to clients, and therefore, helps us make our client’s needs known to the community. CMH architects and Hatcher Design Associates created a new floor plan for the CAS Center for Youth & Families that will enable CAS to grow to serve more children, youth, and families. 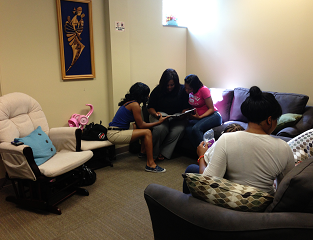 •	A first-floor Family Library Resource Center with books, CDs, and DVDs. The Home at Last Campaign,a $2.7 million comprehensive fund-raising effort, will cover the purchase of the new building and its renovation, archive our case files digitally, establish a building maintenance reserve fund, and enhance selected programs. A Challenge Goal of $3 million will help underwrite selected Adoption Support Program and Prevention/ Permanency Programs. We are excited to have John D. Johns—Chairman, President, and CEO of Protective Life Corporation—as Campaign Co-Chair for the Home at Last Campaign and alongside him as Co-Chair is Dr. Catherine J. Randall of Tuscaloosa who had longtime leadership roles with the University of Alabama and Randall Publishing before retiring. A prestigious and dedicated group of business and community leaders has joined them as their Campaign Leadership. Meredith Calhoun of Corporate Realty Associates, Inc. and Bailey Knight of BHK Investments are co-chairs of the Major Gifts Committee. Children’s Aid Society has worked behind the scenes as a key community partner to address critical societal and human needs effecting individual children and entire families. With a larger, safer, more accessible and user friendly building, CAS will be able to move into the future with greater visibility for accessing our services and expanded programs designed to prevent abuse, neglect, and instability—and preserve more families. When the campaign components are funded and the renovations are complete, Children’s Aid Society will be Home at Last. We seek your participation in the Home at Last Campaign as a critical next step in our serving Alabama’s most vulnerable children and youth and help us with our overarching goal is to establish family connections, either by strengthening the child’s birth family so they remain in the home, securing care by relatives, or finding an adoptive family or other supportive caring adult connection. 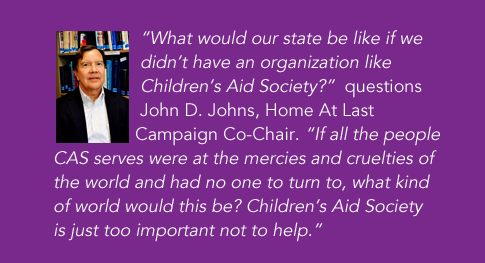 To learn more about how you can help the children, youth, and families of Alabama in lasting ways, please contact Julie Luker in the Campaign Office at 205 945-5333 email jluker@childrensaid.org or Larimer Waldrop & Associates, Campaign Counsel and Alane Larimer, CFRE 205-967-7343, LWA919@aol.com or Susan Waldrop CFRE, 205-802-7009, susanwaldrop12@aol.com .